These lemon tarts are so elegant and especially delightful for afternoon tea. The fragrance of lemon is so tempting and its sourness just balances the sweetness of crust. Every time I make this tart, it becomes a big hit in my family. Combine the flour, salt and sugar in a medium bowl. Use a fork to beat the egg yolk with cold water. Slowly pour the egg mixture over the flour, stirring until the mixture becomes moistened. The dough should stick together and be able to hold the form of a ball. Unwrap the disc and place on a lightly floured surface. Roll the dough from the center of the disc to the edge, until the crust is the desired thickness. If the dough is sticking to the rolling pin, try placing a sheet of plastic wrap over it and then rolling it out. Prick the surface with a fork and chill for 10 minutes in the freezer. Bake blind for 20 minutes in a pre-heated oven at 200C / 390F. Remove from the oven and brush the base of the tarts with lightly beaten egg. Return to the oven for 10 to 15 minutes, until the base of the crust is golden. Transfer to a wire rack to cool. In a medium bowl, whisk the lemon juice, the egg, egg yolks and sugar until smooth. Transfer the mixture to a heavy-based saucepan and cook over medium heat until the mixture begins to thicken, about 10 minutes. Beware not to let the mixture boil. When the curd is thick enough to coat a wooden spoon, reduce the heat to low and continue cooking for 10 more minutes. Remove from the heat and stir in the butter, until melted. Strain the curd through a fine sieve into a medium bowl and stir in the lemon zest. Pour the lukewarm curd into the tart shells. For ease of slicing, chill for at least 1 hour in the refrigerator. Dust with icing sugar and garnish with lemon slices. Refrigerate any remaining tarts for up to 3 days. This recipe is great and your lemon tarts look too delicious! I will try it. Hope you'll enjoy. It's really yummy. That's great. I think you'll love it. They're definitely very cute and dainty. Nice dessert for a party. Sure, it'll be a superstar in a party. OOOOOOH,....AAAAAAH,....OOOOOH?...these tartlets look divine! I am just learning how to make shortcrust pastry from scratch & I must try your lovely recipe,....This is pure evil!! the lemon tarts look so neat and gorgeous. I love lemon. Thanks. The sweet and sour taste of the tarts is wonderful. I was thinking of making some tarts. Where can I get the tarts shell in Sydney? These desserts looks very tempting.My son love custard tarts. While we were in New York. He ate 3 at once for almost the whole week. One of the shop sells very good ones and they are the best I have ever eaten. These kinds of tart moulds are easily found at any bakery shops. what did you do with the beaten egg for the custard? in the directions you seemed to only use the 2 egg yolks. Add the beaten egg with the egg yolks to make the custard. Thanks for asking. Updated the directions. Will the tart shell turn soggy? I tried most tart recipes and the tart shells goes soft or soggy just after a few hours. That's the moist of the fillings going into the shells after a few hours. You may brush some butter before adding the fillings. It'll help. Sorry, another question. 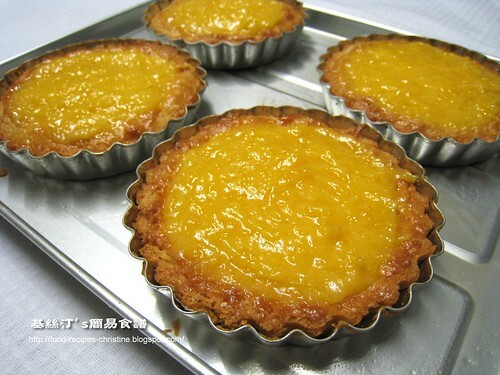 Instead of 4 pcs of 10 cm tart mould, can I use the whole recipe for a 9" tart mould? If using 9" tart mould, the tart will be a bit shorter. Or you may increase all the ingredients by 1.2. After pouring in the lemon curd in the tart base, do I have to put it in the oven again or just put it in the fridge? "chill for at least 1 hour in the refrigerator." How long does this recipe take to carry out? Hi, it takes about 80 to 90 mins for preparation and cooking time.